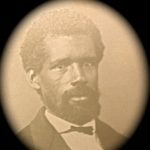 William A. Stewart was born in 1834 in Mercer County to Lemuel B. and Margaret Stewart. He married Isabelle Berry and they had two children, Emma and Eugene. William educated himself when a young man and studied law, and was admitted to the bar in 1853. 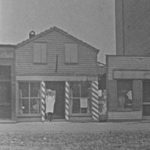 His color, however, stood in the way of a successful practice, so he returned to his trade as a barber. He moved to New Castle (Pennsylvania) and became a well-known and respected barber. He owned a shop on East Washington Street (Ed note: it was eventually torn down. The Stritmater building replaced it and most recently housed Lannigan’s Pub). Later, he studied medicine and type-setting. In 1877, he received the Republican Party nomination for County Associate Judge, winning the nomination over a number of white candidates. He was the first man of color ever nominated for a county office in Pennsylvania. Mr. Stewart associated with the leading men of the city, and was a member of the Symposium, an organization formed by local lawyers, doctors, teachers and other professional men that held meetings for the intellectual profit of its organizers. No one doubted his ability or capability for the position of Associate Judge, but racial prejudice was very strong at the time. While the Republican party had an 841 vote majority in the county, many Republicans, his own party that nominated him, refused to support his nomination and he was defeated by 160 votes. Photos: Stewart and his barber shop on East Washington Street, New Castle Pennsylvania.